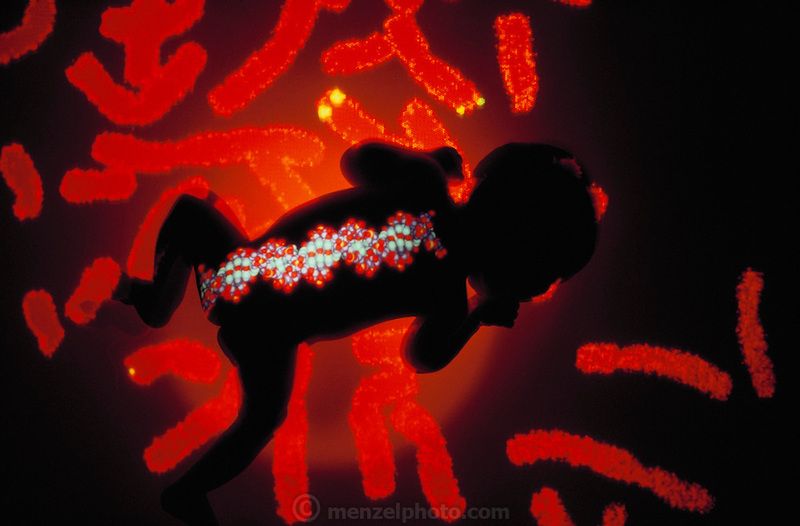 Montage of a fluorescence micrograph of human chromosomes showing the mapping of cloned fragments of DNA (DNA probes), overlaid with the silhouette of an infant & a computer graphics model of the DNA molecule. The chromosomes are stained to give red fluorescence; with the DNA probes represented as small regions of green/yellow fluorescence. Mapping chromosomes may be regarded as a physical survey of each chromosome to find the location of genes or other markers. DNA mapping is one phase of the human genome project, an ambitious plan to reveal all of the genetic information encoded by every human chromosome.